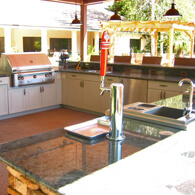 Outdoor kitchens and bars go together like — well –an outdoor kitchen with a bar! Nothing complements great food and great times with family and friends more than a comfortable bar area. Enjoy the game, or just great conversation. Do people expect to come to your BBQ for food and food? No, it’s food and drink! So you need an outdoor bar to complement your outdoor kitchen. Don’t worry, you don’t have to build two areas. We can help you integrate bar seating into outdoor kitchens, especially with our exclusive bar height or bi-level outdoor cabinetry. Outdoor kitchen bar designs are a WerEver specialty. We build a variety of cabinets to hold appliances, beverage centers, ice makers, kegerators, and more. Plus, we have a unique bi-level or bar height cabinet that lets you build a bar wall without requiring the construction of a wall. For help planning your own outdoor kitchen bar, please call today or fill out our online form to get free material samples. We’ll provide a free design and no obligation quote with 3D renderings of your finished project. 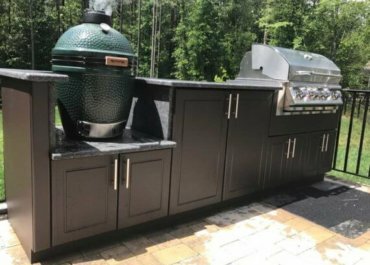 It doesn’t cost you a dime for any of our expert design help, and the outdoor kitchen concept is yours to keep.